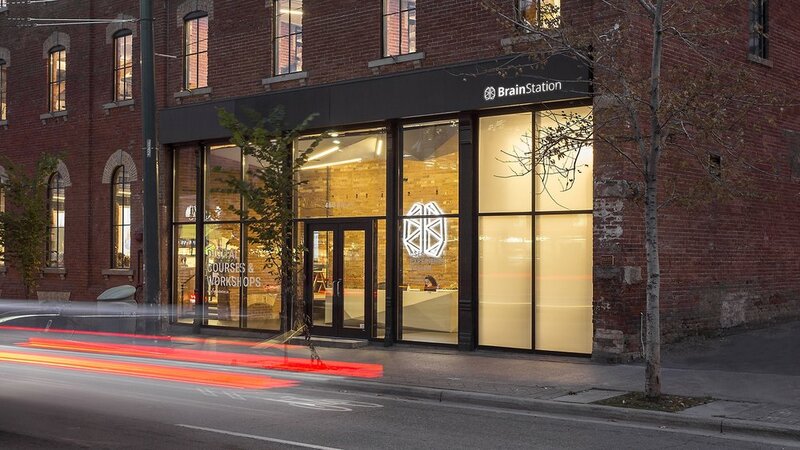 Toronto-based developers, North Drive, asked Reflect Architecture to create a space for them that would be a contemporary integration of office, sales centre, and event space. In working with North Drive, whose brand ethos is tied to the concepts of strengthening community, nature, and honest materials, the expansive west-end park across from the site was a clear starting point for the conceptualization of the design. Playing off of certain elements found in the park, such as a trellis and a picnic bench, the firm worked a mini park through the unit. The greenery delineates the space that is intended predominantly for the client’s guests and that which is used for daily operations. Inspired further by the landscapes of Norway, a culture that resonates with North Drive’s core values, Reflect Architecture focused on muted, clean materials and dramatic lighting; not forgetting to include that little bit of the vibrant pink that sometimes illuminates Norway’s spectacular mountain tops in the transitions between day and night. An oversized glass box is a spacious and airy office where the partners work and host impromptu or semi-private collaborations with their teams, as needed. Also, responding to needs of a contemporary workspace to be both open and quiet, Reflect Architecture designed individual workstations to be set against felt panels that drop out of the ceiling. These panels are oriented to let natural light in, but also to provide some physical and acoustic privacy within the open workspace. Myodetox, a Canadian company founded in 2015, offers a unique and forward-thinking experience in the manual therapy space. 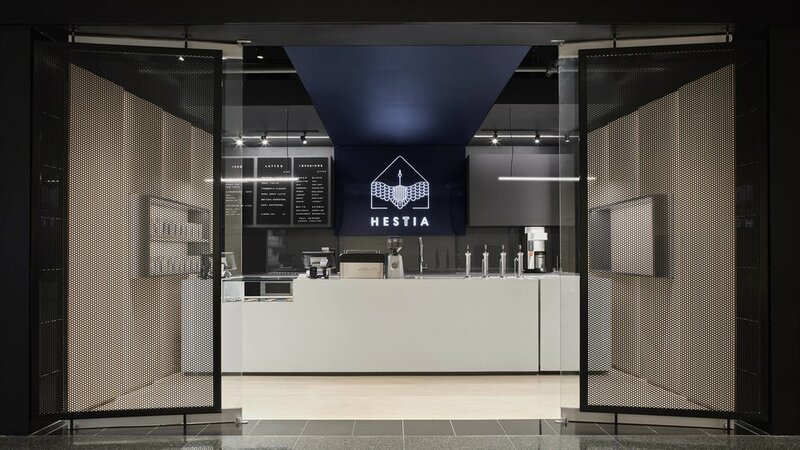 Supported by their prolific following on social media, the company, and their growing community, required a new architectural experience that would align with Myodetox’s vision. In 2016, Myodetox reached out to Reflect Architecture to help them conceive of a design and aesthetic that would best articulate their brand and elevate their guest experience. Myodetox West Hollywood is the 4th of the series of clinics; a space where the design has evolved around the successes and learnings of the previous designs. 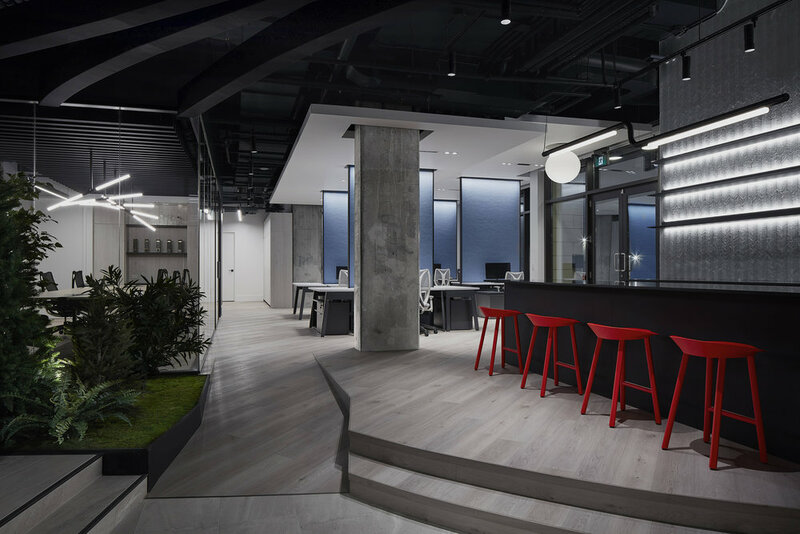 Each space reflects the company’s unique needs at the time of the clinic’s inception, and Myodetox West Hollywood represents the company’s transformation and rapid growth across Canada and into the US. Inspired by contemporary retail design, Myodetox and Reflect worked to create a health and wellness space that stepped away from traditional clinic design, typically defined by a row of chairs, antiquated magazines, and small treatment rooms. Myodetox West Hollywood’s retail and hospitality-oriented design positions the public programs forward to the street, while the treatment area is pulled back but consists of open-concept treatment pods and a movement space where therapists can assess and treat the mobility of members and guests. This open treatment area aims to promote community and empowerment through body confidence, but each pod is equipped with a hidden curtain that can be pulled out where privacy is required. Reflect worked closely with Myodetox to select a set of materials that would both emanate a sense of luxury, without feeling precious, and would speak to the aesthetic of technical athletic wear. To ensure brand continuity, many materials are consistent across all locations. However, certain elements in the design package are designated to be inspired by the local context and uniquely designed. For example, the a-symmetrical “X” element, in the Myodetox West Hollywood space, was inspired by the forms and finish of a surfboard. Furniture specification and design in collaboration with Gerrell (Jor-el) Wilson.